Republican Bob McDonnell dropped the F-bomb during a radio interview. WASHINGTON (CNN) - Bob McDonnell, the normally-disciplined Republican candidate for governor in Virginia, mistakenly blurted out the F-bomb during a live radio interview on Friday. 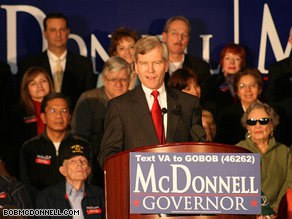 Appearing on Washington-area radio station WTOP, McDonnell was sparring with host Mark Plotkin on the topic of transportation funding. Plotkin asked if McDonnell would consider an increase in the state gasoline tax to help fund the transportation budget. McDonnell said no, and uttered the expletive during his response. "So no tax will be raised during your four-year term?," Plotkin asked. McDonnell answered: "I'm going to find other ways to be able to fund transportation. I've outlined twleve f-ing funding mechanisms that are creative, that are entrepreneurial." The remark was first flagged by the Virginia Democratic blog NotLarrySabato. McDonnell is running against Democrat Creigh Deeds in the governor's race, one of two marquee political battles in 2009 along with the New Jersey governor's race. UPDATE: McDonnell communications director Tucker Martin said McDonnell's remark was nothing more than a verbal flub. "At one point Bob was speaking quickly, and in trying to say 'funding mechanism,' he stumbled and accidentally said another word," Martin said. "It was unintentional, and anyone who spends any time around Bob knows he does not use such language. It was an accident. It is that simple." Martin called it "disappointing" that the Deeds campaign is spending "so much time and energy aggressively pushing this absolutely trivial matter to every blog and media outlet they can think of." to hike in Argentina or call our President a Liar!! !